FutureQuakePress: Happy New Year! 2015- How we start! Going to be posting this both here and over on the Quaequam Blog, as this is an overall 'facts & figures' post, as well as a heads-up for the new year. Here's where we stand at the start of 2015. Scripts waiting to be read: 15 scripts- 70 pages worth of material. Scripts waiting to be commissioned: FQ- 22 Scripts- 93 pages. SW- 22 Scripts- 101 pages. Strips commissioned: FQ- 30 strips- 120 pages. SW- 15 strips- 70 pages. Strips completed: FQ- 12 strips- 62 pages. SW- 3 strips- 11 pages. So, as you can probably work out- we've got a lot of strips in progress- around a solid years worth. Which is great- if you've been commissioned. If not- then the above shows just how far ahead we are planning so please remember to be patient with us. Writers- we read all scripts in the order we get them. The only way to shortcut this is to send us a pitch that we like. If we ask for a script from a pitch we will read it sooner, while it is fresh in our memory. Artists- if you want to see your work appear in one of the finest small press titles in the UK, with a track record of creators moving into professional work; then get in touch. As you can see from the data above- we have a lot of scripts waiting for you. If you want a critique of your work- drop me a line- I'm always happy to see new artists and can even find try out scripts to help you out if your work needs polish before seeing print. Coming from FQP in 2015- Marking the tenth year of publication we will be bringing out our first ever trade collection. What is in it? 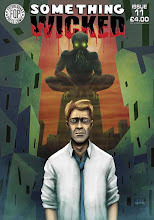 That is for a post closer to the time, however it will be launching at The Comics Festival in April. 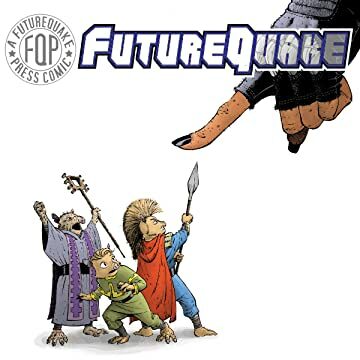 We will also release this year: FutureQuakes 26, 27 (and maybe even 28 depending on the delivery of strips) Something Wicked 11, Zarjaz 23, 24 & 25 and finally Dogbreath 30. I'll be starting to post the next wave of strip previews over the next few days so stay around to see what FQP will be bringing your way in 2015.